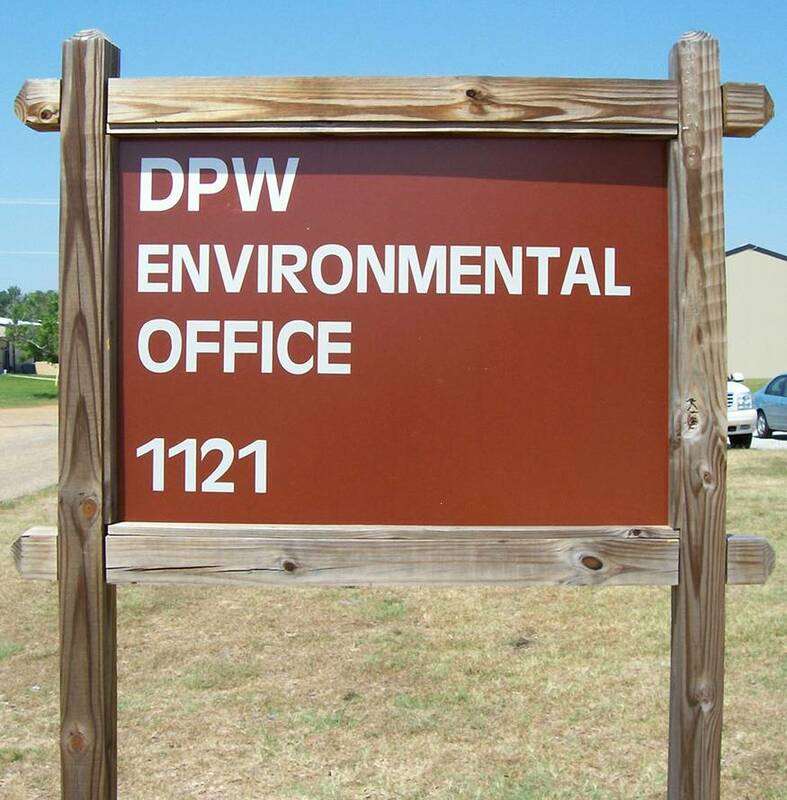 The Fort Rucker Environmental and Natural Resources Division office is located in building 1121 on Dilly Branch Road, near the Daleville gate and the Aviation Museum. If coming on post from the Daleville gate, you will be on 3rd Avenue. If coming in from the Ozark gate or Enterprise gate, you will be on Andrews Road. Turn on Nighthawk Street from either Andrews Road or 3rd Avenue. Once on Nighthawk Street, follow it and bear right when the road forks which becomes Dilly Branch Road. Follow the road a short distance around a 90 degree, left curve, and proceed straight until the road ends. Take a left past Building 1120, which has a tall flag pole. We are directly behind Building 1120. You may park in the parking spots on the road or in the parking area adjacent to the building. DPW-ENRD at Fort Rucker is comprised of Department of Army civilians who are dedicated to providing environmental guidance, support, and liaison services to those who live, work, and train on the installation. Our role is also to ensure Fort Rucker complies with all the necessary environmental requirements. It is important that we follow environmental laws and regulations to protect the environment and to ensure a good quality of life for everyone (clean land, air, and water). It is also important because an environmental spill, incident, violation, or penalty could interfere or interrupt the mission. Of course, our staff cannot do every action or be everywhere at all times, so we coordinate and work regularly with the Fort Rucker senior leadership, as well as a network of others in all organizations on post to ensure the proper environmental procedures are followed. The most important person in our network is each organization’s Environmental Officer. Personnel within DPW-ENRD are not employed by the Environmental Protection Agency (EPA) or the state regulatory agency (Alabama Department of Environmental Management). We are employed by the Department of the Army for the purpose of helping the installation to meet its environmental requirements. We are on your side, and here to assist Fort Rucker in staying "Above the Best". The DPW-ENRD staff has a diverse and experienced background. Some are retired military, or served some amount of time in the military before civilian service, or are married to a military spouse. Many have worked for the Army or Fort Rucker for many years. A few have had experience in private industry. Some have completed bachelors and masters degrees at educational institutions across the country. All staff members have worked in many different environmental program areas over the years, and can successfully provide backup support to the others whenever needed. The diversity also allows for the exchange of ideas, perspectives, and lessons learned from various job experiences.